One of the more interesting (okay, more difficult) jobs undertaken by Tower Works recently, was AD8J’s install, up in Weaverville, NC. This gives you some idea of the locale, not conducive to a typical tramming operation! Once the beam was ON the tower, it was relatively easy to continue stacking tower sections, simply being mindful of the elements as we hauled up sections through them. Once we were high enough, we hauled up the beam, such that the guy bracket was below, and installed the first set of guys. Hot, sweaty, labor-intensive stuff with temperature hovering in the high 90s. 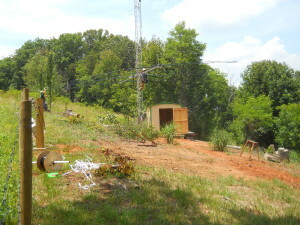 We simply repeated the process as we built the tower higher, until we had the beam above the final guy station. Then the only hard part was lifting the beam out and away from the top plate, to get it up and over and on the mast. But we prevailed, and I see John has made a bunch of QSOs already in this weekend’s IARU contest. From Weaverville, we headed to KY, where the job was the takedown and removal of a US Tower TX-455 crankup, which will replace W2ZI’s broken tower down in Daytona Beach. The tower itself came down easily enough (right on the trailer, actually, again as planned), but the final clean up and securing it to the trailer took some time. And a tad slower going home with the extra weight behind us. Next up, some local NC/SC jobs.